The emergency information/medical information is on the inside of the wristband so it’s perfect for people who want to keep their information discreet. They are comfortable, hard wearing and waterproof, perfect for everyday wear. 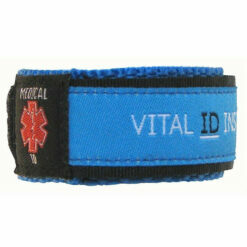 These medical ID bracelets stands out and are very noticeable due to its bright colour and medical symbol. 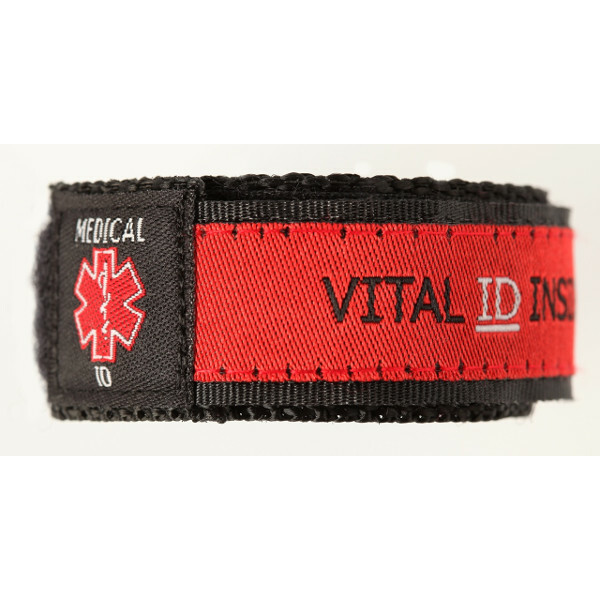 The outside reads “Vital ID inside” in order to let medical personnel and emergency responders know that your important medical information can be found inside the bracelet. The bracelet is made of a hard wearing but comfortable material so it can be worn at all times. 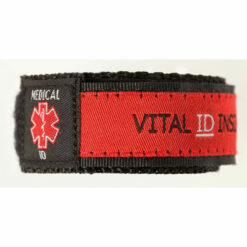 The strip containing your medical information in contained in a pocket on the inside of the strap. It’s waterproof so you don’t need to take it off for swimming or bathing. The strap has a Velcro closure so it’s easy to put on or remove for kids, teens and adults! Great for school, childcare, birthday parties, summer camps, holidays and your own personal medical ID! Buy now for peace of mind. Very well made – I doubt the waterproof claim so I wrapped the paper inside in clingfilm -it remains to be seen… also it took me a minute to work out where to slide the paper in. Thank you it was delivered incredibly fast! Good product, except it specifically stating it’s waterproof. I used a sharpie permanent marker pen to write on the info slip, but after a few showers the pen has run and smudged badly. I wanted something I didn’t have to remove while in or around water, but it seems this might not be the solution. Other than that it’s a great product. Discreet but also obvious to people who know to look and comfortable. Great product. Discrete yet visible to emergency service personnel who are aware of such items. Comfortable to wear and the information card has enough space to put essential information onto it. Highly recommended.